Uphill use of Mt. Ashland’s permit area and its surrounding areas by means of skinning, snowshoeing, hiking, and running has gained popularity. Mt. Ashland is located on public land. Public land is governed by a Special Use Permit issued to Mt. Ashland by the USFS. Users must abide by the rules and regulations established by Mt. Ashland and the USFS when accessing the ski area both during and after operating hours. It is prohibited for any person to approach within 100 yards of grooming machines, winch cats, and winch cables. Access to Mt. Ashland’s trails or property at any time, with or without a ticket/pass, is at your own risk and you assume all risks of injury or death associated with your use of resort property for any reason. Respect all closures, warning signs, and ropes no matter the time of day or season. If you decide to leave the ski area boundary, you are responsible for understanding and accepting the risks that you choose. You may not enter, leave, or re-enter Mt. Ashland resort through a closed area. The following are the policies you must follow for uphill travel at Mt. Ashland Ski Area. Please use common sense and good judgement at all times. Be aware of other skiers and riders approaching from above and below when on the mountain. Snowmobiles, snow cats, winch cables, and other equipment may be encountered at any time. You assume all risks of encounters with this machinery and equipment. Stay to the side of groomed runs. Anyone accessing chairlifts or using marked runs for downhill travel within the permit area must have a valid lift ticket or season pass. -Juliette, Upper Juliette to “Ski Area Boundary” sign line to summit. Stay to the Eastern side of these trails and “Ski Area Boundary” sign line. Always be on the lookout for snowmobiles, groomers, winch cats, and winch cables. Do not enter areas where machinery is in use. Most machinery operations occur after hours. Wear reflective and visible clothing, make yourself visible. Headlamps are required to be on before 8:00 am and after 4:30 pm. Dogs must be on a leash and owners must clean up after their dogs. Mt. Ashland is not responsible for injury to dogs or pets. Owners will be held responsible for any damages or injuries to persons or property due to their animal. 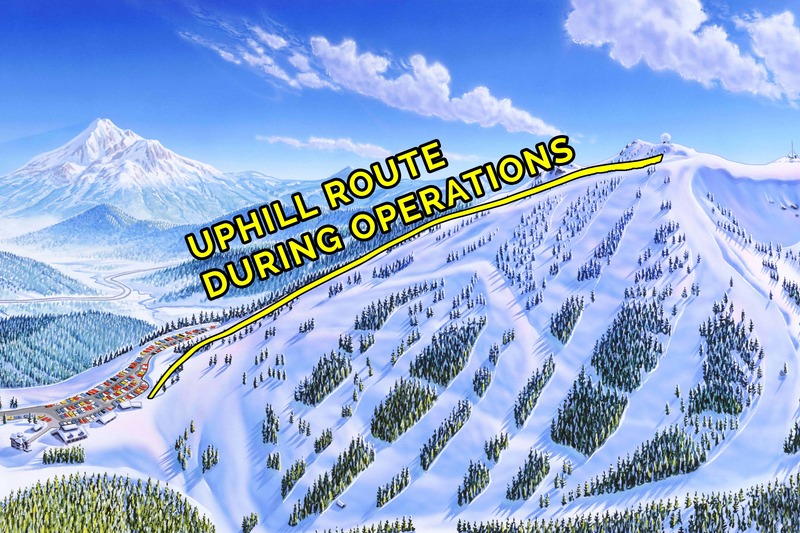 If your presence on Mt Ashland’s property presents a hazard or if staff feels that you are impeding the operations of the resort, you may be directed to utilize a different location. You must follow such direction, or you will be asked leave the permit area. Stay to the center of the trail for best visibility when visibility is limited. Use of the Terrain Parks and Terrain Park features is prohibited after operating hours. Avalanche Danger and Explosives – Avalanche danger may exist at any time along many uphill routes. Travel with appropriate rescue gear. Uphill access is prohibited when Avalanche control work is being conducted. Snowmobiles – Stay to the sides of trails during operating hours and in the middle of trails before or after operating hours. Stay away from snowmobiles and make yourself visible if you see one. Snow Cats – Give snow cats a wide berth and make yourself visible to operators. Winch Cat Operations – Cables are dangerous. Under no circumstances may anyone access any area where winch cat operations are taking place. Skiing into a winch cable may cause serious injury or death. Other hazard areas, operations, or conditions may exist on the mountain including but not limited to the following risks: collisions with other skiers or snowboarders, natural and man-made objects, trees, rocks, fences, lift towers and over the snow vehicles; loss of control; variations in terrain and snow conditions; surface and subsurface snow conditions; bare spots; bumps; moguls; ice; stumps; forest growth and debris; erosion control devices; rocks; cliffs; steep terrain; avalanches; and traveling beyond the ski area boundary which poses additional hazards because such areas are not patrolled and are without avalanche control. Other risks include those associated with the use of facilities, lifts, terrain parks, and other park features, walking in lodges and parking lots. Mt. Ashland is a mountain environment that requires your common sense and caution. Read and obey all signs. There is no on-site medical/rescue response after hours and assistance may take a long time to arrive. In case of emergency during non-operational hours, dial 911.